News & Stories > Blue Sky Science > Could we use planarians to help us understand human regeneration? 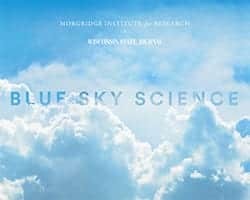 Blue Sky Science: Could we use planarians to help us understand human regeneration? Planarians are flatworms, and they’re masters of regeneration with virtually unlimited capacity to regenerate any missing tissue or body part lost to injury or aging. This amazing ability to regenerate comes from a population of stem cells scattered throughout the planarian body. The stem cells that are responsible for making all of the different cell types and tissues in the planarian. There are a lot of similarities between humans and planarians, and we share a lot of the same organ systems. Planarians have a central nervous system with a brain, eyes, musculature, intestine, epidermis, reproductive structures. But, unlike planarians, humans’ regenerative capacity is very limited. The ability to regenerate is widespread across the animal kingdom. For instance, a salamander can actually regrow an entire limb once it’s been lost. A planarian can regrow any missing body part. In fact, if you take a planarian and amputate it into several little pieces, each one of those body fragments is able to regenerate into a whole new worm. Scientists want to better understand the process of regeneration. How does a wounded tissue sense an injury, know what’s missing and know what it needs to make or regenerate next? During regeneration it’s important that the right cell types are made, in the right numbers and proportions, in the right place and time. And all of these processes need to be carefully coordinated in order for regeneration to go on properly. Many of the same genes and developmental processes that drive regeneration in planarians are present in humans as well. Anything scientists learn about regeneration by studying a relatively simple creature, like a planarian, can hold important clues into how they could one day coax human cells to behave similarly and help humans regenerate injured or missing tissues.